Will Obama succeed to rally Hispanic voters? Some evidence from Wikipedia data. Just a few hours before the ballots open for the 57th presidential election, the key question for us data scientists is: which data set could really show some special information, that would not be easily available through a classic poll. We have already seen some interesting correlations of Wikipedia usage with the ongoing campaign – just looking on how many people would search for the page on the candidates would provide a time series with many fascinating details. Today we focused on the question, if the Democrats had been successful to rally Hispanic voters for Obama’s support. 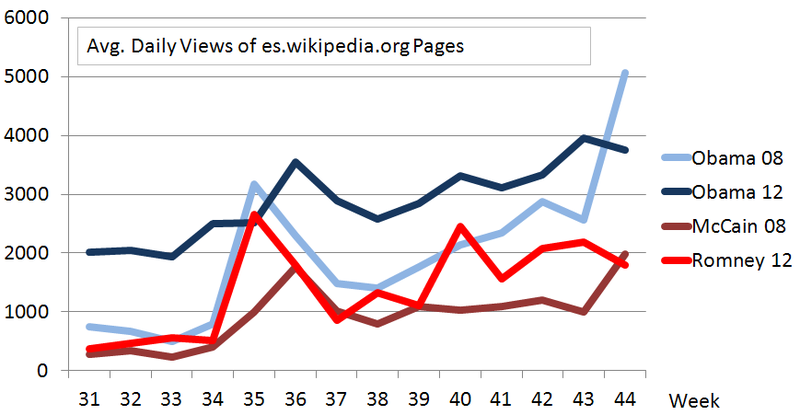 We took the Spanish Wikipedia, checkt the daily views of the Obama’s Spanish language Wikipedia-page and compared this with 2008 and also with the time series of his Republican competitors. Obama clearly leads – not only in absolute numbers but in particular regarding the increase of this year’s views with four years ago. While Romney would have gained 66% in views compared with McCain, Obama’s views would have more than doubled. 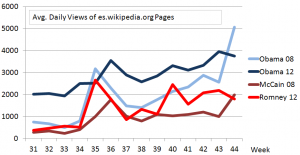 The daily views of Obama’s Spanish Wikipedia-Page have been constantly higher than four years ago while the Repubican candidates would at least at the beginning of the campaign have remained more or less on the same level. However: results for last week show an interesting difference: both candidates loose attraction regarding their Wikipedia relevance. However, if we look just on the last week prior election day, we can see something strange happen: the view’s of Obama’s es.wikipedia-page have droped from the daily average of 5065 in 2008 to merely 3752 in 2012. The same is true for Romney versus McCain: 1795 average views in this year’s 44th week compared to 1986 in 2008. This decreasing interest in the candidates is not reflected in the numbers that we see on other election-related search-terms. If we e.g. take ‘US Presidential Election’, we count 2672 daily views during the week before election day in 2008 and 3812 views in 2012 – the same rise in interest that we found in the English Wikipedia, too. (See the last post “Why the 2012 US elections are more exciting than 2008”). While the general interest in the elections is huge, the candidates no longer draw that much attention of the Spanish speaking community. Maybe “Sandy” would work as an explanation since the campaing was halted during the Hurican – nevertheless it would not be plausible why only the candidates but not the election in general would suffer in awareness from this. So we cannot draw a clear conclusion from our findings. There is evidence that Obama would have succeded to some extend to activate the interest of Hispanic people but regarding the unexpected drop we will have to drill further down. The real work, though, will anyway start right after the vote: to learn what would have been a signal and how we can seperate these from the noise next time.